New and Improved, Flexible Full Sized Keyboard. This revolutionary keyboard is water resistant, flexible, and dust and contaminant proof. The keyboard is great for use in industrial environments, hospitals, libraries, and marine and boating applications. In fact, almost anywhere dust and liquids are present! The silicon based material is impervious to almost anything! The washable, roll-able keyboard has been called Other best thing to happen to typing since the backspace key. Win, 2000, XP, Vista and 7. 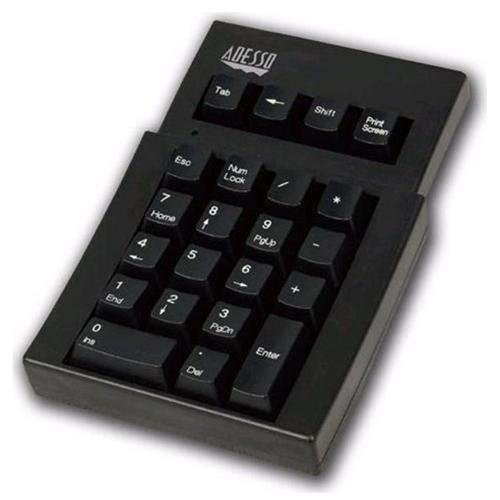 The mechanical keypad offers desktop and notebook users the benefits of a full-sized external numeric keypad in a compact form, featuring 22 keys. The tiny snap users feel through their fingertips and the subtle click heard confirms each keystroke. This mechanical switch features a 20 million keystrokes lifecycle. It is innovative and portable, designed for mobile professionals, notebook users, point of sale, kiosks, financial institutions, libraries and more.